On Tuesday, more than 200 Google employees spoke out against their employer in an open letter that urged the company to drop Project Dragonfly: a censored search engine designed for the Chinese government that enables state surveillance. 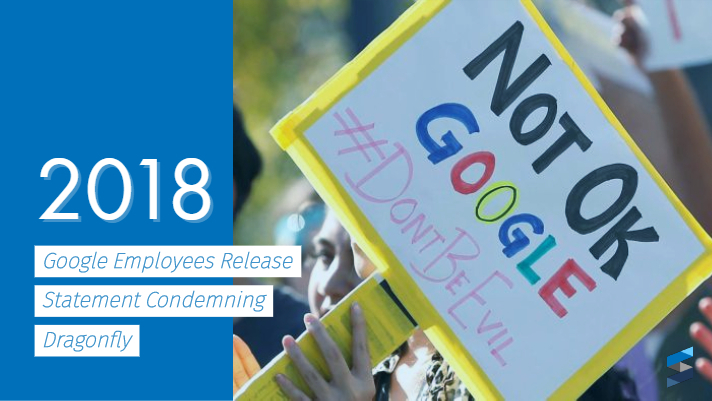 “Our opposition to Dragonfly is not about China: we object to technologies that aid the powerful in oppressing the vulnerable, wherever they may be,” employees write in “Google Employees Against Dragonfly” – a letter published on Medium. The letter also states that employees have raised concerns for months, but have so far found the response of leadership “unsatisfactory”. This open protest letter follows an Amnesty International campaign that opposes the censored search engine. Amnesty’s main concern is that Dragonfly would set a dangerous global precedent for government crackdowns on freedom of expression. If it proceeds, Project Dragonfly would end an eight year stalemate for Google in China that started with Google’s departure over political pressure and hacking threats against the Gmail accounts of human rights activists. “Many of us accepted employment at Google with the company’s values in mind, including its previous position on Chinese censorship and surveillance, and an understanding that Google was a company willing to place its values above its profits. After a year of disappointments including Project Maven, Dragonfly, and Google’s support for abusers, we no longer believe this is the case. This is why we’re taking a stand. In response to this shift in focus Google employees had this to say, “Providing the Chinese government with ready access to user data, as required by Chinese law, would make Google complicit in oppression and human rights abuses.” Where before Google’s aim was to “meaningfully increase access to information for people in China”, they now appear to be considering re-launching in China with the Dragonfly project – further helping the Chinese government commit human rights abuses. With many scandals in the news lately, Google’s reputation has taken a bit of a hit. However, it remains to be seen whether or not this protest will change the corporations mind about project dragonfly.